The hardest thing about dieting is finding things that are not only healthy and low in calories, but also tasty and satisfying. Personally I find the best way to diet is by eating soups and salads. This salad came to me as I had some prawns or large shrimp and all the ingredients for a good salad. I then had an idea as I had received from someone a spiralizer. With the spiralizer made cucumber spaghetti it was so simple, looked great and was pretty damn good in the salad. I now use it often with other veggies and it is a great alternative to pasta. Cut one end of the cucumber then cut a piece about 8 inches long. Put the cucumber in the spiralizer and twist, making yourself some nice cucumber spaghetti, place in a bowl and drizzle with the vinegar of your choice and season with black pepper and give it a good toss or stir. Squeeze the lemon juice into a pan, let it heat up and add the garlic. Sauté the garlic for a couple of minutes as you don’t want to burn it and make it bitter and then add the prawns or shrimp. When the prawns or shrimp start to turn pink turn them over and sprinkle with chili flakes. Season with salt and black pepper and give them a good stir around to coat all the shrimp. 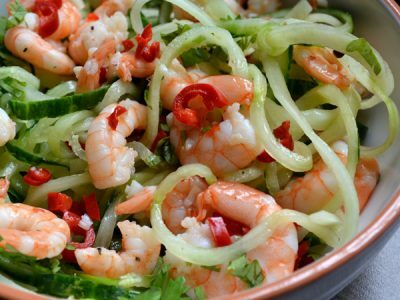 Remove the prawns or shrimp when they are nice and pink and place them on top of the cucumber, sprinkle some of the chopped parsley or corainder leaves and the chopped fresh chili over the top leaving some to garnish and give it a good toss to combine. Sprinkle over the rest of the parsley or cilantro and serve.